别 名 FKBP12; dJ576K7.1 (FK506 binding protein 12 rapamycin associated protein 1); FK506 binding protein 12 rapamycin associated protein 1; FK506 binding protein 12 rapamycin associated protein 2; FK506 binding protein 12 rapamycin complex associated protein 1; FK506 binding protein12-rapamycin associated protein 1; FK506 binding protein12-rapamycin associated protein 2; FK506-binding protein 12-rapamycin complex-associated protein 1; FKBP rapamycin associated protein; FKBP12 rapamycin complex associated protein; FKBP12-rapamycin complex-associated protein; FLJ44809; FRAP; FRAP1; FRAP2; Mammalian target of rapamycin; Mechanistic target of rapamycin; mTOR; MTOR_HUMAN; OTTHUMP00000001983; RAFT1; Rapamycin and FKBP12 target 1; Rapamycin associated protein FRAP2; Rapamycin target protein 1; Rapamycin target protein; RAPT1; Serine/threonine-protein kinase mTOR. Specific References (5) | bs-1992R has been referenced in 5 publications. [IF=0.00] Tian, Jing, Rong Liu, and Quanxin Qu. "Role of endoplasmic reticulum stress on cisplatin resistance in ovarian carcinoma." Oncology Letters. WB ; Human. [IF=2.81] Yang, Wei‐Rong, et al. "mTOR is involved in 17β‐estradiol‐induced, cultured immature boar Sertoli cell proliferation via regulating the expression of SKP2, CCND1, and CCNE1." Molecular Reproduction and Development (2015). WB ; Pig. [IF=2.70] Zou, Deling, et al. "Ranolazine improves oxidative stress and mitochondrial function in the atrium of acetylcholine-CaCl 2 induced atrial fibrillation rats. "Life Sciences (2016). WB ; Rat. [IF=4.44] Madka, Venkateshwar, et al. 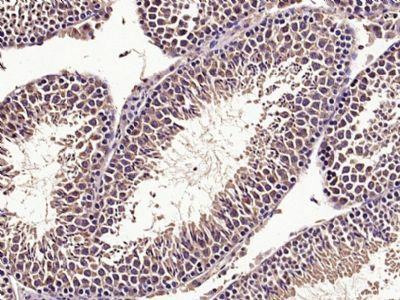 "Targeting mTOR and p53 signaling inhibits muscle invasive bladder cancer in vivo." Cancer Prevention Research 9.1 (2016): 53-62. 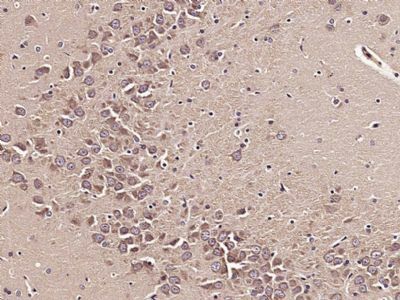 IHC-P ; Mouse. 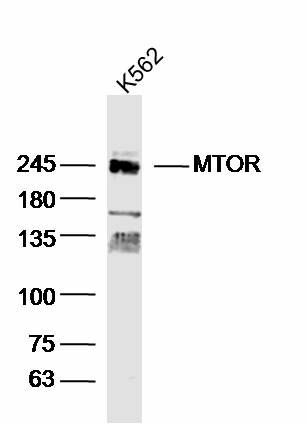 mTOR is one of a family of proteins involved in cell cycle progression, DNA recombination, and DNA damage detection. In rat, it is a 289-kDa protein (symbolized RAFT1) with significant homology to the Saccharomyces cerevisiae protein TOR1 and has been shown to associate with the immunophilin FKBP12 in a rapamycin dependent fashion. 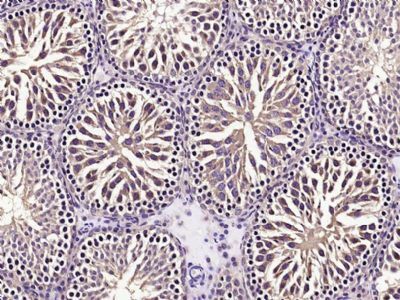 The FKBP12-rapamycin complex is known to inhibit progression through the G1 cell cycle stage by interfering with mitogenic signaling pathways involved in G1 progression in several cell types, as well as in yeast. 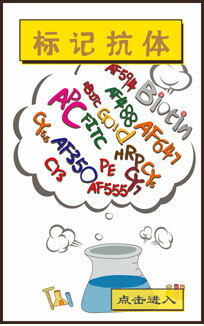 The binding of FRAP to FKBP12-rapamycin correlated with the ability of these ligands to inhibit cell cycle progression. Serine/threonine protein kinase which is a central regulator of cellular metabolism, growth and survival in response to hormones, growth factors, nutrients, energy and stress signals. Functions as part of 2 structurally and functionally distinct signaling complexes mTORC1 and mTORC2 (mTOR complex 1 and 2). Activated mTORC1 up-regulates protein synthesis by phosphorylating key regulators of mRNA translation and ribosome synthesis. This includes phosphorylation of EIF4EBP1 and release of its inhibition toward the elongation initiation factor 4E (eiF4E). Moreover, phosphorylates and activates RPS6KB1 and RPS6KB2 that promote protein synthesis by modulating the activity of their downstream targets including ribosomal protein S6, eukaryotic translation initiation factor EIF4B and the inhibitor of translation initiation PDCD4. Regulates ribosome synthesis by activating RNA polymerase III-dependent transcription through phosphorylation and inhibition of MAF1 a RNA polymerase III-repressor. In parallel to protein synthesis, also regulates lipid synthesis through SREBF1/SREBP1 and LPIN1. To maintain energy homeostasis mTORC1 may also regulate mitochondrial biogenesis through regulation of PPARGC1A. mTORC1 also negatively regulates autophagy through phosphorylation of ULK1. Under nutrient sufficiency, phosphorylates ULK1 at 'Ser-758', disrupting the interaction with AMPK and preventing activation of ULK1. Also prevents autophagy through phosphorylation of the autophagy inhibitor DAP. mTORC1 exerts a feedback control on upstream growth factor signaling that includes phosphorylation and activation of GRB10 a INSR-dependent signaling suppressor. Among other potential targets mTORC1 may phosphorylate CLIP1 and regulate microtubules. As part of the mTORC2 complex MTOR may regulate other cellular processes including survival and organization of the cytoskeleton. Plays a critical role in the phosphorylation at 'Ser-473' of AKT1, a pro-survival effector of phosphoinositide 3-kinase, facilitating its activation by PDK1. mTORC2 may regulate the actin cytoskeleton, through phosphorylation of PRKCA, PXN and activation of the Rho-type guanine nucleotide exchange factors RHOA and RAC1A or RAC1B. mTORC2 also regulates the phosphorylation of SGK1 at 'Ser-422'. Part of the mammalian target of rapamycin complex 1 (mTORC1) which contains MTOR, MLST8, RPTOR, AKT1S1/PRAS40 and DEPTOR. 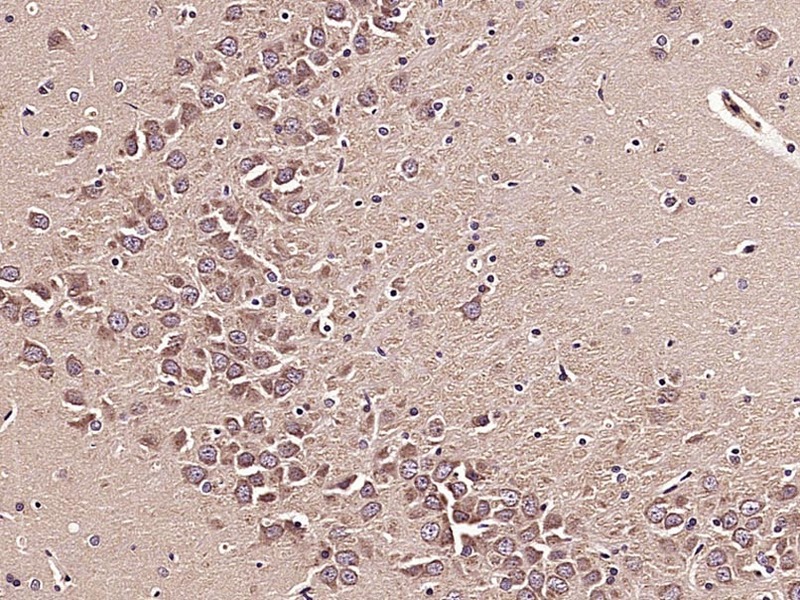 Part of the mammalian target of rapamycin complex 2 (mTORC2) which contains MTOR, MLST8, PRR5, RICTOR, MAPKAP1 and DEPTOR. Interacts with PPAPDC3 and PML (By similarity). Interacts with PRR5 and RICTOR; the interaction is direct within the mTORC2 complex (By similarity). Interacts with UBQLN1 (By similarity). Interacts with TTI1 and TELO2 (By similarity). Interacts with CLIP1; phosphorylates and regulates CLIP1 (By similarity). Endoplasmic reticulum membrane; Peripheral membrane protein; Cytoplasmic side. Golgi apparatus membrane; Peripheral membrane protein; Cytoplasmic side. Mitochondrion outer membrane; Peripheral membrane protein; Cytoplasmic side. Lysosome. Cytoplasm (By similarity). Nucleus, PML body (By similarity). Note=Shuttles between cytoplasm and nucleus. Accumulates in the nucleus in response to hypoxia (By similarity). Targeting to lysosomes depends on amino acid availability and RRAGA and RRAGB. 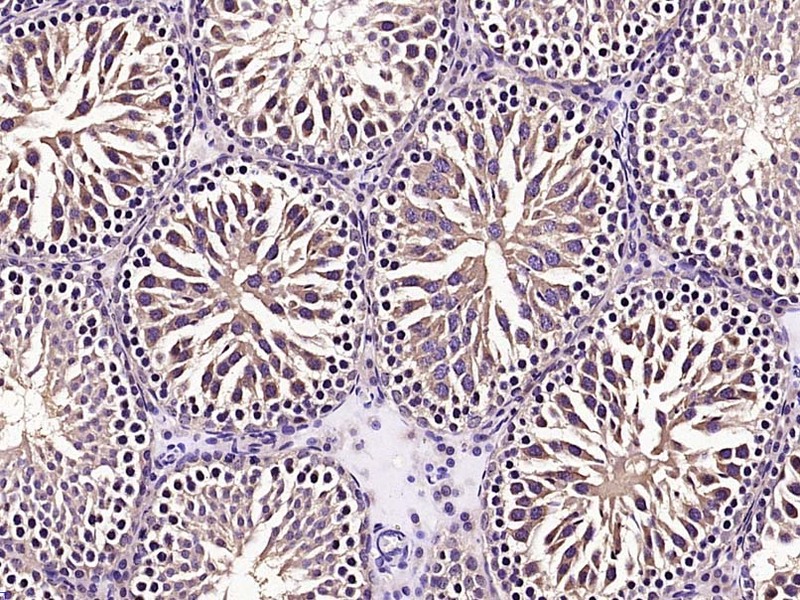 Expressed in numerous tissues, with highest levels in testis. Phosphorylated. Autophosphorylates when part of mTORC1 or mTORC2. Phosphorylation at Ser-1261 promotes autophosphorylation. Paraformaldehyde-fixed, paraffin embedded (Mouse testis); Antigen retrieval by microwave in sodium citrate buffer (pH6.0) ; Block endogenous peroxidase by 3% hydrogen peroxide for 30 minutes; Blocking buffer (3% BSA) at RT for 30min; Antibody incubation with (MTOR) Polyclonal Antibody, Unconjugated (bs-1992R) at 1:400 overnight at 4℃, followed by conjugation to the secondary antibody (labeled with HRP)and DAB staining. Paraformaldehyde-fixed, paraffin embedded (Rat brain); Antigen retrieval by microwave in sodium citrate buffer (pH6.0) ; Block endogenous peroxidase by 3% hydrogen peroxide for 30 minutes; Blocking buffer (3% BSA) at RT for 30min; Antibody incubation with (MTOR) Polyclonal Antibody, Unconjugated (bs-1992R) at 1:400 overnight at 4℃, followed by conjugation to the secondary antibody (labeled with HRP)and DAB staining. Paraformaldehyde-fixed, paraffin embedded (Rat testis); Antigen retrieval by microwave in sodium citrate buffer (pH6.0) ; Block endogenous peroxidase by 3% hydrogen peroxide for 30 minutes; Blocking buffer (3% BSA) at RT for 30min; Antibody incubation with (MTOR) Polyclonal Antibody, Unconjugated (bs-1992R) at 1:400 overnight at 4℃, followed by conjugation to the secondary antibody (labeled with HRP)and DAB staining. 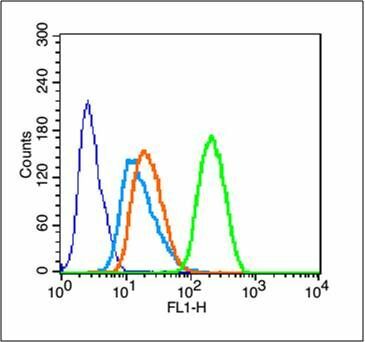 Primary Antibody (green line): Rabbit Anti-MOTR antibody (bs-1992R), Dilution: 1μg /10^6 cells. Isotype Control Antibody (orange line): Rabbit IgG. Secondary Antibody (white blue line): Goat anti-rabbit IgG-FITC, Dilution: 1μg /test.